What is a mini dental implants (MDIs)? The MDI System consists of a minature titanium implant that acts like the root of your tooth and a retaining fixture that is incorporated into the base of your denture. The head of the implant is shaped like a ball and the retaining fixture (denture) acts like a socket that contains a rubber O-ring. The O-ring snaps over the ball when the denture is seated and holds the denture at a predetermined level of force. When seated, the denture gently rests on the gum tissue. 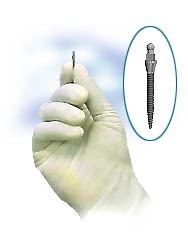 The implant fixtures allow for micro-mobillity while withstanding natural lifting forces. The development of long term MDIs now allows the Oral Surgeon to place anchors in the jaw during one minimally invasive treatment. The most common use for MDIs is the stabilization of dentures and overdentures. MDIs firmly anchor the dental prosthesis, which means there is no longer any need to suffer with ill-fitting, loose dentures. MDIs are designed to usually eliminate bone grafting and expedite treatment. Full implants sometimes require significant bone grafting and a recovery period. The latent period allowed the anchor of the implant to properly embed itself into the jawbone. The smaller size of MDIs means that the recovery period is reduced, and the denture can be fitted shortly after placement. The whole mini dental implant placement procedure takes approximately one hour. Generally, in the case of lower jaw implants, four MDIs will be placed about 5mm apart. Prior to inserting MDIs, the Oral Surgeon will use many diagnostic and planning tools to find the optimal place to implant them. 1. A mild anesthetic is administered. 2. A small hole is drilled in the jawbone to situate each MDI. 3. Each implant is screwed into place and tightened with a winged wrench. 5. The denture is measured against the mini implants and marks are made to indicate where the MDIs will fit. 6. The denture is sent to the laboratory to have holes drilled to accommodate the MDIs. Is the Mini Dental Implant FDA approved?